seek national inputs on results and act as ambassadors for a transnational implementation of policies by participating in transnational meetings between representatives of national boards. The boards will consist of approximately 10 persons to participate in the project work and share the results. 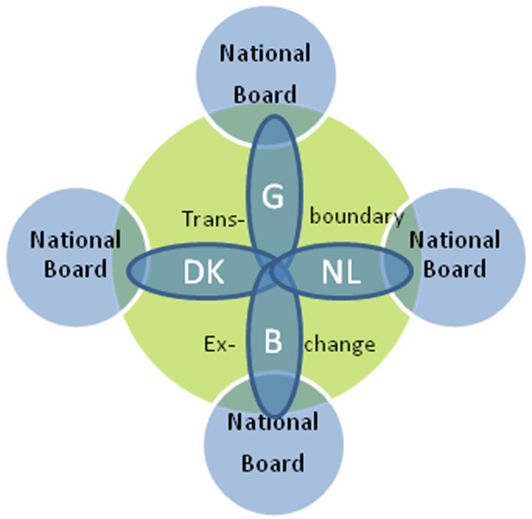 During meetings in the national boards experts from other countries may participate – depending on topic - to ensure the exchange of different experiences and knowledge gathered in the field. The motivation of external stakeholders to invest their time in the project is assumed to be the direct access to up-to-date information related to groundwater management under changing climatic conditions. For that reason project members are advised to define within work packages the products that might have high relevance for the board members. These products will be the starting point for discussions and guarantee a winwin-situation for both parties: the project team as recipient of valuable inputs and the board members as recipients of recent information on newest data, technology and assessment results. For each case-study- country potential board-members are listed at the end of this document. Most of them are already contacted and many of them already signed letters confirming their interest in participation. Still, final decisions in regard to the composition of the boards will be taken after project approval in close collaboration with all project partners concerned.